I has so much fun making my butterfly yesterday, I thought why not try another one today? !So, I set out to create a floral image. 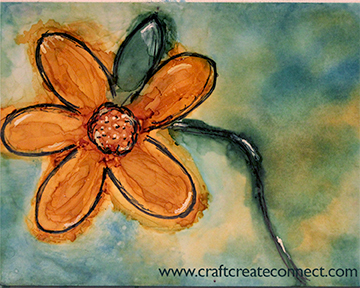 I am sticking with simple as I get the sense of what I can and can not do with alcohol ink painting and today I added a new twist to the process. I found citrasolv at our local grocery store so gave it a try! As was expected, my image started out quite abstract and I wanted to add some detail in, so the play began. This time, I used a combination of Tim Holtz alcohol ink blending solution and the citrasolv to attempt to manipulate the ink. Primarily, it blended and in some cases, removed the ink. With that in mind, I even attempted to “erase” things that weren’t quite visually right. It was fun to see what would happen as a drop would spread and move the ink even further underneath it and overall, I am happy with what I created. Its a big fun learning, creating adventure! Very nice. I like it a lot! Thanks so much! And thanks for taking the time to comment! Nice!! I love it! I would say you are a pro now using this technique!! Not sure about pro, but sure having some fun! Thanks Maria! What is Citrasolv? This ended up truly fun! Citrasolv is actually a highly concentrated natural cleaner. Turns out that out of the bottle it really will strip paint! Jane mentioned it in her creative mompeneur article and I found it at the grocery store!